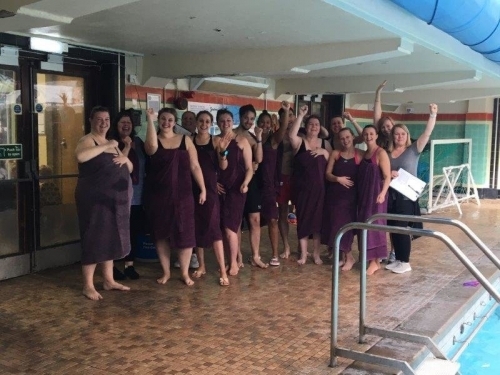 A group of teachers from Annie Lennard Primary School have raised over £1500 for Black Country Women’s Aid by swimming the length of the Channel at Smethwick Swimming Centre. The challenge raised money for BCWA’s Go Purple campaign to raise awareness for the victims of domestic abuse. They swam the channel in two hours with a collective total of 1126 lengths. ASDA donated purple bath towels for the swimmers in keeping with the purple theme. The teachers raised an impressive amount of money and thanked Smethwick Swimming Centre staff for accommodating them and helping them with the challenge. Well done to Annie Lennards primary school! To find out more about Black Country Women’s Aid and read about how you can get involved in fundraising click here.